Actually, tactical activities such as PR as well as other forms of promotion such as sales and advertising were tucked under the heading of marketing nearly 60 years ago. But someone a lot younger than I am obviously still hasn’t received the memo. Social historians, such as Dr. James Stoddard, a marketing professor at Appalachian State University where I will guest lecture on strategy next week for one of his colleagues, gives us insight into how marketing evolved over the last 150 years. The period from the end of the Civil War until the 1920s, is known as the “production era.” Then the Great Depression ushered in the “sales era” where promotion became a tool to unload products. That all changed after WWII, but many marketers, including far too many in my former profession of community destination marketing, are still stuck in the 1930s. These DMO’s are made obvious by their obsession and that of the communities they represent with mega-facilities, mega events and then paying subsides in order to get visitors to come. This creates a never-ending cycle guaranteed to hollow out any sense of place in these communities, robbing them of their innate appeal. Marketing had turned the corner from these techniques by 1960 when Dr. Theodore Levitt published Marketing Myopia in the Harvard Business Review, which was expanded into a book during the first decade of my now concluded career. That means my former peers have had more than three decades to shift gears. So why are so many marketers, though much younger, still stuck so far back in the past including those hoping to be enabled by a handful of legislators in North Carolina eager to facilitate long since obsolete forms of “desecration marketing” along roadsides? We know now from longitudinal studies that this was five years after the effectiveness of traditional advertising tipped into its long slow decline to where it now has a negative return on investment. “To understand mass market tourism, think about mega hotels, theme parks, chain stores and the new generation of enormous (4,000 to 5,000 passenger) cruise ships. Mass market tourism is about quantity. Mass market tourism is also about environments that are artificial, homogenized, generic and formulaic. Gallup not only conducts research into workforce engagement but also “customer engagement,” which is a primary objective of marketing. 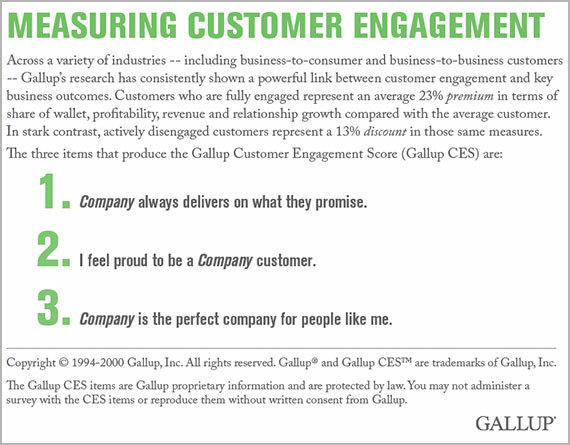 Across a variety of industries, Gallup finds a “powerful link between customer engagement and key business outcomes.” Fully engaged customers represent a 23% premium over the average. On the other hand, actively disengaged customers who work against you represent a 13% discount. Company [organization or community] always delivers on what they promise. I feel proud to be a customer. Company [organization or community] is the perfect one for people like me. In his new white paper entitled Contextual Marketing and the New Marketing Contract, analyst Brian Solis teases out that “empathy makes engagement personal” and when paired, it is “context that makes things relevant,” regardless of the marketing technology used. Beginning decades before the Internet, marketing became not just a way to follow customer orientation. according to Stoddard, but the means to guide an organization’s direction. For a community destination marketing organization that isn’t stuck in the distant past, this means that marketing is a tool not just for promotion but the means to safeguard a community’s distinctiveness. The road to marketing empathy for a community begins with being comfortable in your own skin and seeking not the masses but only those for whom you strike a chord. It is this overarching strategy that has enabled Durham, a relative latecomer, to leap frog much more established destinations in North Carolina, most of which are trapped in the pre-WWII sales driven world. It is a world that exchanges distinctiveness of place and empathy for pure mass and homogenization, trading authenticity for mainstream until there will be no reason to go there or no one left in that dwindling market segment. Sales obsession is what leads some communities to sacrifice soul for envy, build structures that draw fewer than those they replace, recruit events that displace more tourism than they bring. In other words, a river of no return. It is part of the continuing evolution from the product focused marketing of the early 1900s to the customer-centric marketing that emerged after WWII. In a community marketing sense, it begins by not trying to be something you community isn’t but seeking appeal instead to paraphrase McMahon in urban forests, historical context, locally-owned businesses and organic districts, history and people-scaled settings.